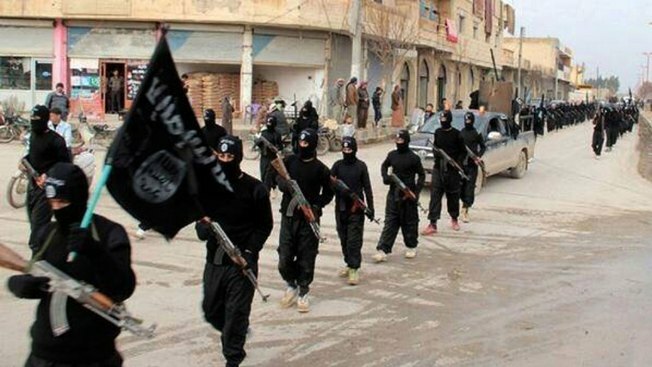 FILE - This undated file image posted on a militant website on Jan. 14, 2014, which has been verified and is consistent with other AP reporting, shows fighters from the Islamic State group marching in Raqqa, Syria. The Pentagon said a top Islamic State leader in Iraq's Anbar province has been killed by a coalition airstrike. Pentagon press secretary Peter Cook said Abu Wahib and three others were killed when their vehicle was struck on May 6 in Rutba. He said Wahib's death is a blow to the group's leadership. A senior U.S. official said it was an American airstrike. The official was not authorized to discuss the matter publicly, so spoke on condition of anonymity. Cook said Wahib was a former member of al-Qaida in Iraq and has appeared in Islamic State execution videos. There have been unconfirmed reports in the past suggesting Wahib was targeted by strikes, but this is the first time the Pentagon has said he was killed.